There are California wineries with names like Folie à Deux and Rubicon that suggest the idea of even starting one is a little crazy. 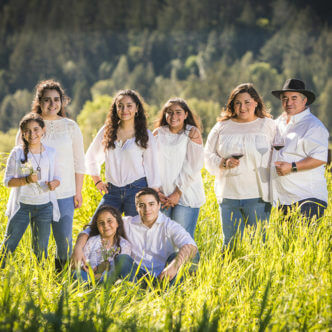 But for Rolando and Lorena Herrera, naming their Napa Valley winery Mi Sueño—Spanish for “My Dream”—was as inevitable as their faith in their own abilities to achieve success in a very tough, very expensive venture. Their dream is proudly an American Dream, for the Herreras certainly did not come from wealth. Rolando grew up in a rural area of Mexico, helping his grandparents work a six-acre farm they eventually had to sell to make ends meet. In 1975 the family moved to California’s Napa Valley, but moved back to Mexico after five years. When Rolando turned 15, he returned to Napa Valley and lived in a plant nursery while he finished high school, washing dishes at Cindy Pawlcyn’s Mustards Grill and graduating to line cook. In 1985 Rolando met Warren Winiarski, owner of Stag’s Leap Wine Cellars, who hired him to break up rocks for a stone wall around his property, then later offered him an opportunity to work the grape crush and help out in the cellar. After three years, Rolando became cellar master at the winery, while taking courses on viticulture and enology at Napa Valley College. Mi Sueño makes wines in various price ranges, some at the high end of California bottlings. The basic line includes Los Carneros Chardonnay ($42), Sonoma Mountain Chardonnay ($55), Los Carneros Pinot Noir ($42), Russian River Valley Pinot Noir ($55), Cabernet Sauvignon ($75), Syrah ($55), Tempranillo ($55), and a red blend made of primarily Cabernet Sauvignon and Syrah, “El Llano” ($49). The Herrerras make their wines unapologetically in the big, bold California style in which alcohol can work its way up to 14.6% in the Chardonnays, while the red wines stay at the reasonable 14.5%. The Chardonnay, particularly the 2013 Perla ($70), is a very lush wine, but some of that comes from the caramel flavors picked up from 32 months of aging in French oak, which you will definitely taste. I prefer the more subtle 2014 Los Carneros ($42), which spends only 10 months in barrel, so that even at 14.5% alcohol its richness is in better acidic balance and the fruit is not as pronounced. Of the red wines I tasted the 2013 Rebecca Cabernet Sauvignon ($138) was my favorite, and it compares well with a lot of the most prestigious California Cabs at that price. The fruit is a boon to this wine, for after 22 months in 100% French oak the tannins began to be tamed. Only 115 cases were made and are available through allocation only. So the Herrera story is inspiring, not solely because these immigrants, like so many who came to America to follow their dream, have succeeded so admirably, but also because the results are as impressive as others’ who began with much more money and much more doubt.